Home » News » Local News » Tow Truck Tragedy Brings Closure To Couple Owners! By BStigers on April 15, 2019. 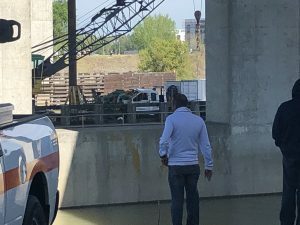 The Tow Truck Tragedy that occurred on March 26th on the Pioneer Bridge over the American River in Sacramento reached a closure point yesterday when the vehicle was raised from the bottom of the river and a woman’s body was found inside identified as the missing co-owner and wife of the other co-owner. Roselyn Sharma was identified by authorities as family members including their 17-year-old son Justin watched the recovery from the banks of the river. The two owners were inside the vehicle when an accident with a semi-truck pushed the tow truck over the side of the bridge and it plunged 30 feet into the swift and cold current of the American River. It took almost three days for private crews and equipment to bring the vehicle up from the river bottom. The husband was found on Friday 5 miles downstream from the accident scene. The truck will be transported to a CHP location for a full investigation.